It’s been three years since I graduated in college and I sincerely miss being a student. I’ve found myself becoming nostalgic on student life. The student discount, the long summer breaks, the library and the being situated in a classroom filled with amazing friends/classmates. But I will be very honest. I am not a good student during my time. I struggle a lot in terms of managing my time and end up sacrificing going to classes for my event hosting. I may have mentioned this before in my post My Life, My Job, My Career and 6 Things That Made Me Succeed, I almost dropped school because hosting weddings, debuts and birthdays just provided me enough money. I guess that’s the reason why sometimes before I sleep at night I get a lot of what ifs. What if I studied harder? Maybe I graduated with Latin honors and make my parents more proud. What if I became a better classroom president? Maybe I got the respect and affection from my colleagues that I long for. And the biggest what if has been… What if I managed my time correctly? Maybe things will be different from what it is today. And since June mark the start of new school year I dedicated a back to back posts for my SavingsPinay student readers. A productivity post and a financial lesson post that every student can benefit with. My goal is to spare you from living the professional life in regret. I want you to spend each day being a student productively and learn how to save enough money so that after college you can easily adopt to the ruthless reality of being a salaried man. Please enjoy and share if you find this post helpful. Learning how to effectively manage your time as a student can help you in so may ways. You won’t get behind in your classes, you’ll feel a sense of achievement every day for being on time and you’ll realize that things are easier when proper time management is added. Below are nine ways to help you get started. This is something I wish I learned during my student years. Now that I am already working I became very much dependent on my bullet journal which serves as my planner and calendar in one. I am not suggesting that you jump on a bullet journal right away but it is important to have a system that you will commit with. If you love a notebook planner then you can easily buy a well-designed one in National Bookstore. You’ll be more encouraged to write if you love the look and the feel of the planner. You also need a monthly calendar to schedule things and block days for periodical exam, for review or for any important occasions in your school. You can also go digital in your planning by using either your Ipad or tablet and downloading apps like Sunrise (which I use as a monthly calendar) or myHomework Student Planner for so you can being your planner anywhere. Just keep it on a safe place. To know more student planner and student calendar posts then visit IzzaGlino for I will be publishing a student series every Tuesday for starting next week. Make writing an action plan a habit. You can read my Perfect To Do List posts to help you better with this. Basically all you have to do is list down 7-10 must do items of the day and make sure that you give a deadline for each. Write the assignment that you need to finish, the review on a subject where you’ll have an exam or just important stuff for the special project that is due next week. Developing good study habits as early as now is highly important. Once you have a good study habit you don’t need to cram at night reviewing for an exam the following day. It will also be easier for you to memorize lessons and formulas. You will become much more focused in studying because you are following a good system. I have a younger sister whose nine years my junior and I’ve seen how being addicted to social media made her less focused on her studies. She will go on Facebook and Youtube rather than doing her assignment and reviewing her lessons. The more you became addicted in social media the more you’ll develop Mañana habit (mamaya na lang) and this is a very bad scenario. Good time management is all about getting things done without sacrificing anything. Learn the power of 50-10 where in for 50 mins you’ll do your must have item and then take a 10 mins break after where you can do whatever you want. This way you’ll get things done plus you’ll also have some time to enjoy. Your student life is your only chance to prepare for the professional world. It is important that you become mature when it comes to your life choices. Do prioritize on things that are most important instead of wasting your time on stuff that won’t help you achieve your goals. I know that as a student you ought to enjoy but too much enjoyment will not get you to a successful life. Develop your skills while you are still young and you are sure to end up in a much better working environment. Having good time management is definitely a must have. Study well and try to be very responsible in life. 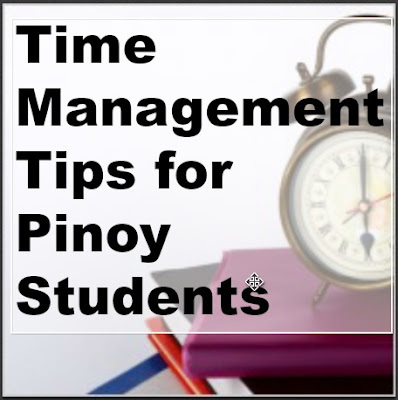 Time management will help you balance your studies and your time with family, friends and fun. How To Get Through the Day – New!